WinWrap® Basic v10 uses certificates to authorize actions during the design of the application and execution of scripts. Run any Basic object or control is created by the executing Windows application. Edit/Debug a BasicIdeCtl control or BasicIdeObj object is created by the executing Windows application. CheckPassphrase a developer uses the '#EditingCert or '#ViewingCert comment. WinWrap® Basic application developers are required to have one Development certificate installed on their development machine. Your WinWrap® Basic host application is deployed on the end-user's machine with the appropriate Application, Azure Website or Server certificate. Each installation uses the same certificate. Only the actions authorized by the certificate are allowed. If a Development certificate exists, its characteristics limit the actions authorized. This certificate does not expire on an end-user's computer. Allows an Azure Website to Run WinWrap® Basic scripts using WinWrap® Basic - For Azure Websites. The website's host name must match the certificate's host name. 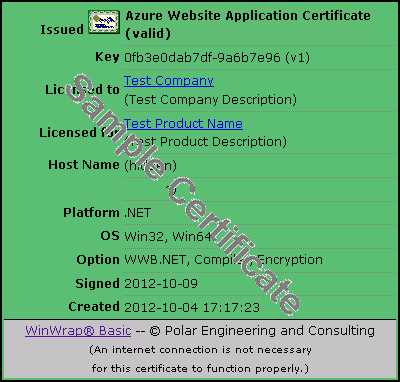 This certificate does not expire on an azure website. Each installation of the host server application uses the same Server certificate. Allows a host server application to Run WinWrap® Basic scripts. A Server certificate does not expire on an end-user's computer. Each development machine requires a specific Development certificate. A Development certificate is specific to a computer name. The certificate authorizes compilation. 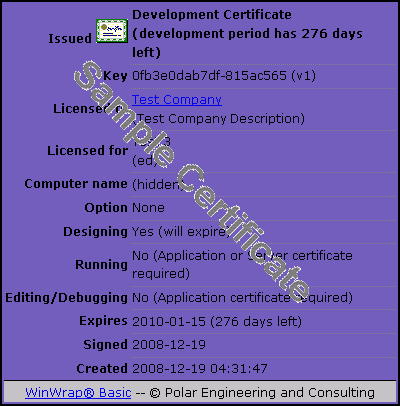 Allows a developer to work with WinWrap® Basic until the Development certificate expires. If no Application/Server certificate is involved, an application can Run/Edit/Debug WinWrap® Basic scripts. A Development certificate does expire. Developers interested in protecting scripts which contain intellectual property can use Permission, Encryption and Decryption certificates. A Permission certificate can only be used in conjunction with a Development certificate. Allows an application to protect scripts when a developer provides the Permission certificate's passphrase. The Development certificate characteristics limit the actions authorized. A Permission certificate does expire. An Encryption certificate can only be used in conjunction with a Development certificate. Allows an application which has the Encryption option to encrypt scripts when a developer provides the Encryption certificate's passphrase. An Encryption certificate does expire. Each installation uses the same Decryption certificate. Allows an application which has the Encryption option to decrypt scripts. A Decryption certificate does not expire on an end-user's computer. If a Development certificate exists, its characteristics limit the actions authorized. An evaluator automatically receives a link for downloading an Evaluation certificate. 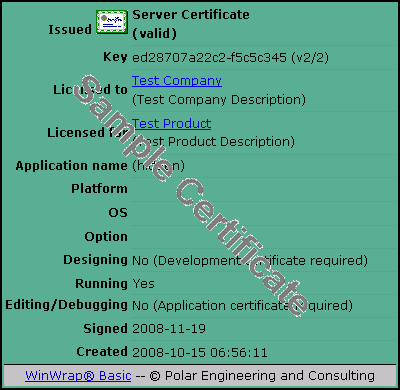 A Development/Application/Server certificate is issued by Polar based on the type of certificate purchased. The developer issues the certificate via the Certificates web page. Non-Evaluation certificates are associated by the LicenseKey. The Secret is 128 bit number. The Computer Name must match the executing computer's name. The Application Name must match the executing application's name (not path). On 32 bit systems both <AppName>.exe and <AppName>32.exe match. On 64 bit systems both <AppName>.exe and <AppName>64.exe match. The EncryptionKey is encrypted and shared by an Encryption-Decryption certificate pair. The Platform must match the executing platform. Encoded as a bit field. The OS must match the executing OS. Encoded as a bit field. The Option(s) enabled. Encoded as a bit field. Designing with WinWrap® Basic components in Visual Studio is allowed. Running WinWrap® Basic code is allowed. Editing/Debugging WinWrap® Basic code is allowed. Expires 60 days after creation. Expires 14 months after the date of the last paid annual fee on all machines. Expires 14 months after the date of the last paid annual fee on a development machine. Does not expire on an end-user machine. Expires 30 days after creation on all machines. A certificate is revoked, if it is listed in the compiled "revoked list". (The revoked list is generated from the cert table based on the CertRevokedDate field.) When revoked, execution fails on all machines. Previous versions of certificates can be revoked also. When viewing a certificate (HTML) the web page displays the cert record info for the Key. If the certificate information does not match the cert record then an "invalid certificate" is displayed. Directory (Win32/Win64): The installation directory. File (Development): Development-<CertKey>.htm or Development.htm. The CertKey value must match <CertKey> in the file's name. Reissued certificates retain the same CertKey. Once a certificate is created, it retains the same CertKey for its entire life. When a developer distributes WinWrap Basic, the developer must install their Application/Server/Decryption certificates to the appropriate directory using the downloaded certificate (htm) files. null Secret: A valid Development/Evaluation certificate. non-null Secret: The certificate of the form Application-<CertKey>-*.htm or Server-<CertKey>-*.htm is checked using the Secret. (Where <CertKey> is indicated by beginning part of the Secret.) A Development certificate can circumvent authorization. Creating an "unlicensed object" (not resident on a Form) at run-time requires an Initialize method call. The Secret property must be set prior to calling Initialize. During the Initialize call the same rules as are applied as when creating a "licensed component". The Design, Run, Edit/Debug and Option actions uses the DesignCertficates\Development-*.htm or DesignCertficates\Development.htm certificate. If that's not found, the Evaluation.htm certificate is used. If the certificate is expired or revoked, the action is not allowed. If the Development certificate is revoked, the action is not allowed. If no authorizing certificate is found, the action is not allowed. The certificate considered must meet the criteria of the certificate (e.g. Computer Name, Application Name, Platform and correct OS). If the certificate is revoked or expired and a Development certificate is found, the action is not allowed. If no authorizing certificate is found, an unexpired Evaluation certificate is the authorizing certificate. If no authorizing certificate is found, the Development certificate with the same LicenseKey limits the number of days left of the authorizing certificate. If the Development certificate is expired or revoked, the action is not allowed. The reissued list is generated from the cert table based on the ReissuedVersion field. A certificate with Version less than the ReissuedVersion is ignored. Developers cause certificates to be reissued. Changing the certificate's expiration date does not change ReissuedVersion. The revoked list is generated from the cert table based on the CertRevokedDate field. When revoked, execution fails on all machines. Polar Engineering revokes certificates.